When you own a retail shop, the ability to keep track of your inventory and have the data in an organized fashion to know when it’s time to reorder and replenish is very important. The Instant Inventory app brings these features and more to your mobile app such as a phone or tablet including the ability to keep inventory records and updated inventory numbers as products move through the system in real time. Instant Inventory allows you to create, manage or control your item stock lists, as well as manage part lists, equipment serial numbers, physical or fixed assets and more with incredible ease and speed. 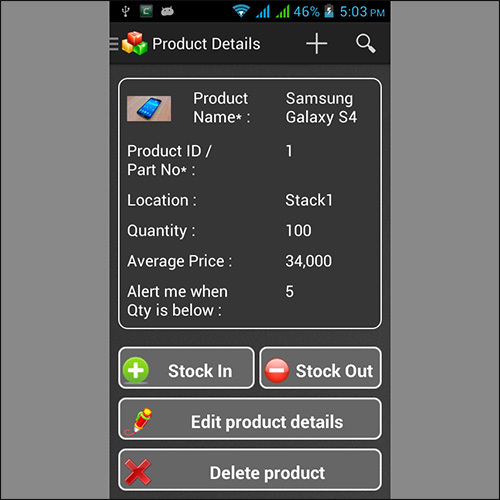 The Instant Inventory app even includes an integrated barcode scanner system to make entering your inventory as simple as possible, and the reporting module allows you to get inventory snapshots quickly and even be alerted when certain products reach critical stock levels. The Instant Inventory app allows small-scale retailers and homeowners to manage inventory of their products or personal belongings. Retailers can update the stock levels as well as record the in/out movement of the items using this app. Made by the software company Billion Hands Technology, the Instant Inventory app also features bar code scanning functionality to allow for the inventory items to be added in a much faster method. Get extensive reporting: Inventory valuation report, Buyer /Seller report, Location report, Daily/Monthly/Date Range Inventory transactions, etc. Overall, I would give the Instant Inventory app a rating of 4 out of 5 stars. Though this app does exactly what it claims to do and should work great for very small retailers with a limited number of inventory items, I found several of the features a little bland and lacking in their functionality. For example, I had a little trouble with the barcode scanner functionality, but I resolved that problem once I discovered the particular “finesse” required to get it to work properly. Additionally, the manual inventory entry form could be a little more user friendly, but overall this app was able to get a review rating of 4 out of 5 stars without too many complaints. If you’re in the market for free inventory apps for your small business, definitely take a minute to try out Instant Inventory.